It’s sort of bodiless too, truth be told (it’s been little more than a foundation since at least the the mid-19th century), but it was lost under Saharan sands, and now has been found again. “After Lepsius the location of the pyramid was lost and the substructure of [the] pyramid never known,” said Zahi Hawass, secretary general of Egypt’s Supreme Council of Antiquities. I guess people didn’t think the decapitated structure was worth keeping exposed, or even pinpointed for tourists. 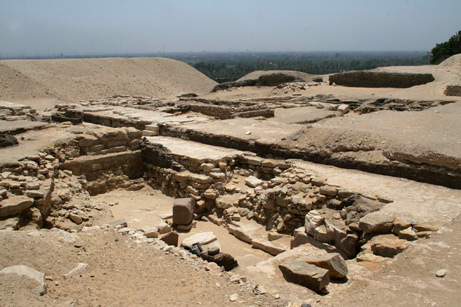 They’ve also uncovered a Ptolemaic segment of the sacred road in Saqqara, which is notable because it suggests people were still angling to be buried there two thousand years after Menkauhor got his headless eternal resting place. This entry was posted on Monday, June 9th, 2008 at 9:39 PM	and is filed under Ancient. You can follow any responses to this entry through the RSS 2.0 feed. You can skip to the end and leave a response. Pinging is currently not allowed. I didn’t see Ang post about this or I would have thrown him an h/t. What kind of monster do you think I am? Maryanne Stroud Gabbani lives near that pyramid and rides horses there. She has been reporting on the lead-up and now the discovery at her Living in Egypt blog. That is way, way cool. Awesome blog and awesome entry. She’s definitely on my daily browse list now. Thanks for the great tip, Dina. I swear, you know everybody. Then you will also appreciate Maryanne’s other great Egypt blogs (found under her profile, of course). Her blogging and then her encouragement were what inspired me to start my own daily photo blog just a few months ago.